2600 direct people, business turnover of around Rs. 8.5 Billion, and having state of art operational facilities across the Pakistan. Group is serving the nation & poultry sector through un-interrupted provision of quality products & services like parent stock, day old broiler chicks, poultry & stock feed, and diagnostic/lab services. 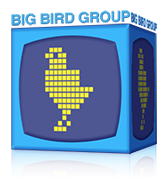 During the last 27 years, Big Bird Group has emerged as one of the major source of poultry production in Pakistan and now has stepped in consumer market and will serve the consumers and customers with quality chicken meat (frozen/fresh chilled) and value added chicken products.